Making beautiful, handmade craft spirits is our passion. 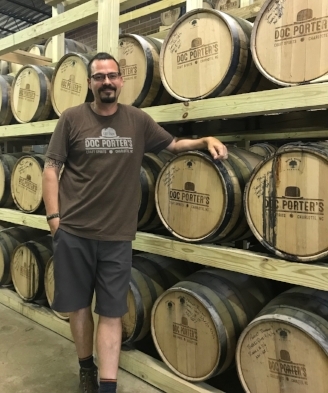 Every drop of Doc Porter's vodka, gin, and bourbon is made from scratch using locally-sourced grains from Marshville and Asheville, North Carolina. We believe in supporting local farmers and North Carolina agriculture, which is just one reason we don't use any processed ethanol (Grain Neutral Spirits). Every product we release is made from start to finish under our distillery roof, right here in Lower South End, Charlotte. We're hands-on in all steps of the process, from milling and mashing to fermentation and bottling. Pay us a visit and we’ll take you on a tour of our facility and show you the distillation process & meticulous care that goes into every bottle we produce. You can also browse our merchandise selection & purchase all of your Doc's gear on-site after tasting the "grain-to-glass" difference for yourself. Our spirits are available for purchase at the distillery (limit 5 bottles per person/per year), ABC stores throughout North Carolina, and South Carolina retailers. Check out some of our favorite cocktail recipes here. Doc Porter, grandfather of head distiller Andrew Porter and our namesake. Doc Porter was the grandfather of our owner and head distiller, Andrew Porter. After serving in the US Navy, he became a radiologist and was a pioneer in his field, working on groundbreaking procedures with radioactive isotopes. He had a love for science, fast cars and his family and when the time came to put a name on the products we are incredibly proud of, his name was the perfect fit. We lost Doc Porter in 2012 but we know he would be proud of what we've built and would have enjoyed sipping on a namesake cocktail. Andrew and Liz Porter are the husband and wife co-owners of Doc Porter's Distillery. It all started back in 2014 when Andrew decided to take his lifelong passion and turn it into a business. Andrew is a Chemical Engineer by day, while Liz works in sports marketing. They balance their careers and the distillery while raising two young daughters here in Charlotte. It's a full and wonderful life and they're proud to contribute incredible craft products to the community they love. Zack Fuller is the Head Distiller and brings experience from all around the world to Doc Porter's. His training has taken him from Vermont to Scotland. Zack joined the team in June 2018 and is already making his mark on the distillery. When he's not cranking out top notch spirits, you might find Zack hanging out with his rescue dog, Nala or playing disc golf. He's also a foodie who's always exploring Charlotte's booming food scene. Jason Harris is the distillery's jack of all trades. He's passionate about spirits and likes to gets his hands dirty and take part in the distilling process. Not only does he work in the production process but he also manages the tasting room, events and sales and marketing. Jason's a big live music fan and when he's not working, you'll often see Jason getting around Charlotte on two wheels as his bike is always the preferred method of transportation.